Jeff Koons is walking through the Gagosian Gallery—all white walls and polished concrete—talking about his latest creations. He wears a slim, sharply tailored Dior suit and speaks in even, measured sentences about his art, which fills every room. Despite the oppressive late-June humidity outside, Koons isn’t perspiring. He must have given this same tour countless times, said the same things about the paintings and sculptures, but his enthusiasm for the work is still just barely contained. Last year, Koons’s sculpture Tulips—an oversized bouquet of seven candy-coloured flowers cast in polished stainless steel—sold for over $33 million at auction, the most ever paid for a work by a living artist. He’s frequently derided by critics for his Warhol-esque, often highly sexualized elevation of kitsch, but he remains prolific and indefatigable, his small army of 100 or so assistants producing a steady stream of work to Koons’s exacting specifications. The artist pauses next to a giant balloon animal sculpture of a swan. It’s more than 10 feet high, in electric-blue stainless steel, complete with stunningly realistic wrinkles and tantalizingly smooth, curvaceous surfaces. It looks precisely like what a balloon animal would look like were it magically enlarged and made mirrorlike. The fact that it also looks, from this angle, like an enormous blue phallus cannot be lost on anyone, but no one mentions it. “The reason I make my work is a philosophical dialogue about how we can experience transcendence in our lives,” Koons says to the gathered admirers, his voice inflected with a gentle Pennsylvania drawl. It might be a bit hard to take Koons seriously when he says things like this, were the scale and detail of the work not so impressive, his enthusiasm so infectious. As it stands—and if you like what Koons does—you just have to let it wash over you, take from it what you can, and use it to supplement the impact of standing in front of the world’s first giant stainless steel balloon swan. Today, in addition to his art, the world’s highest-paid sculptor is here to talk about champagne. 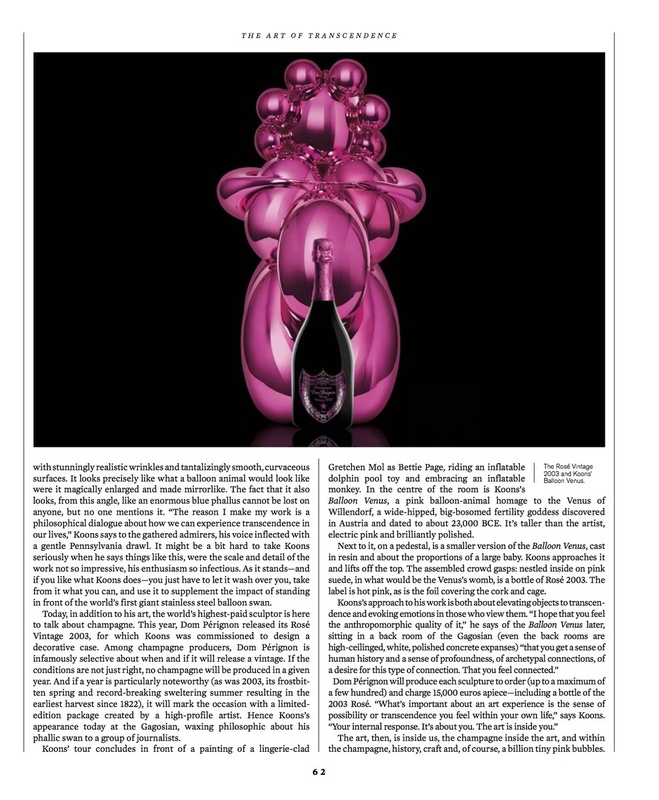 This year, Dom Pérignon released its Rosé Vintage 2003, for which Koons was commissioned to design a decorative case. Among champagne producers, Dom Pérignon is infamously selective about when and if it will release a vintage. If the conditions are not just right, no champagne will be produced in a given year. And if a year is particularly noteworthy (as was 2003, its frostbitten spring and record-breaking sweltering summer resulting in the earliest harvest since 1822), it will mark the occasion with a limited edition package created by a high-profile artist. Hence Koons’s appearance today at the Gagosian, waxing philosophic about his phallic swan to a group of journalists. Koons’ tour concludes in front of a painting of a lingerie-clad Gretchen Mol as Bettie Page, riding an inflatable dolphin pool toy and embracing an inflatable monkey. In the centre of the room is Koons’s Balloon Venus, a pink balloon-animal homage to the Venus of Willendorf, a wide-hipped, big-bosomed fertility goddess discovered in Austria and dated to about 23,000 BCE. It’s taller than the artist, electric pink and brilliantly polished. Next to it, on a pedestal, is a smaller version of the Balloon Venus, cast in resin and about the proportions of a large baby. Koons approaches it and lifts off the top. The assembled crowd gasps: nestled inside on pink suede, in what would be the Venus’s womb, is a bottle of Rosé 2003. The label is hot pink, as is the foil covering the cork and cage. The art, then, is inside us, the champagne inside the art, and within the champagne, history, craft and, of course, a billion tiny pink bubbles.